There are countless articles and publications discussing the critical importance of metadata to the success of your SharePoint service. 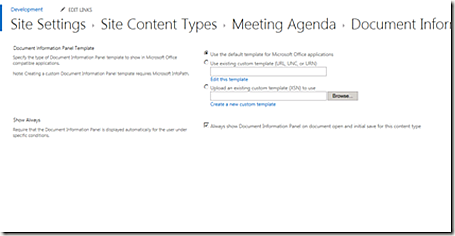 Microsoft Office and SharePoint are very well integrated from the perspective of managing this metadata and there are steps you can take to improve the experience. 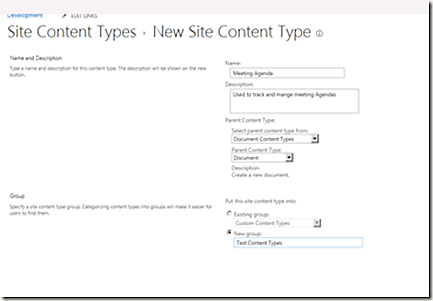 In SharePoint, content types can be configured to show the document information panel (DIP) in the Office client so that users can easily manage the metadata associated with a specific type of content. What happens, though, when this metadata must also appear in the document itself? Double entry is never a win for the forces of productivity and error minimization. It also tends not to be a way to make friends and positively influence your user base. Fortunately there is a way to allow users to manage a document’s metadata using the DIP and having that metadata appear in the document. 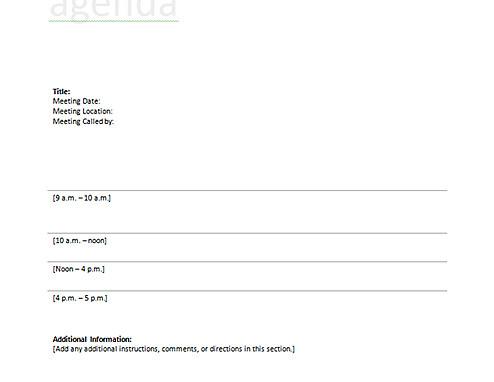 Let’s use a meeting and the management of agendas as our scenario. Your users typically have a difficult time remembering what meeting particular issues were discussed in and the current method of storing them in the file system results in endless lost time searching for the right content. At the coffee station they approach the resident SharePoint nerd who is currently engaged in a heated analysis of last night’s Dancing with the Stars episode with the facilities guy. Eventually they agree to disagree. Due to the fact that there is ample material on how to create a content type and site columns I will not outline the steps in detail here. We’ll add some new site columns to our content type to manage the important metadata such as the title of the meeting, location, date and organizer. 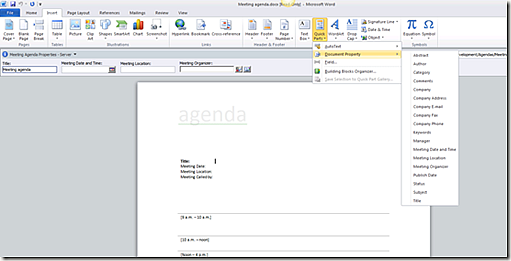 Once your content type is created you need to create a document library to store the meeting agendas and associate it with your new content type. Try this link for more information on how to accomplish this. 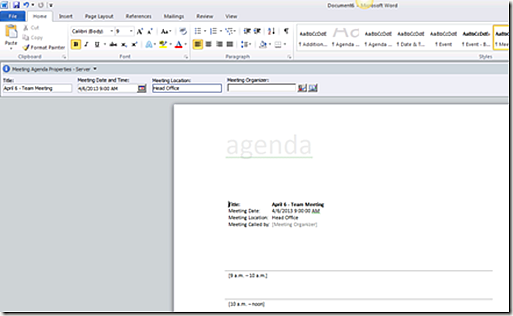 Take your agenda template and upload it to your new document library. Don’t worry about filling in any of the meta data at this point. 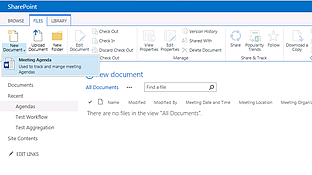 Once your document has been successfully uploaded we’re going to open it from SharePoint and you’ll see that the DIP now dutifully appears at the top of our document. 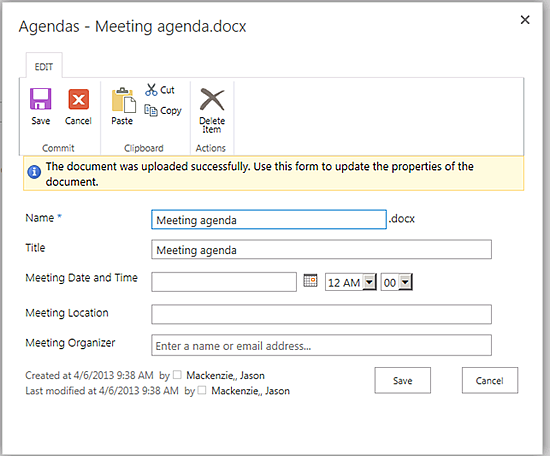 We are now in a position where we can use Office’s Quick Parts to pull the metadata into our document. You’ll note in the screen shot below that the site columns associated with our new content type appear as quick part options to add to our document. Fancy that! Add a quick part in the appropriate place in our document for each site column that you want to pull into the document. When you have completed the above steps save your document locally. Once it has been saved navigate to the Advanced Settings of your new content type and upload the document as the template for your content type. 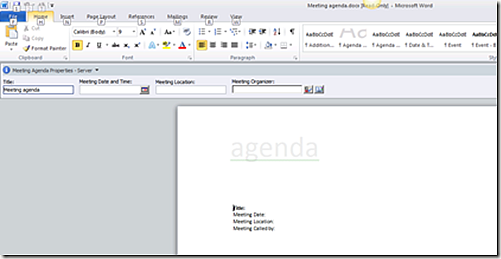 Navigate to your document library and add a new Meeting Agenda. You’ll see that now when your template opens the quick parts will be associated with the metadata shown in the DIP. Changes to the DIP will be reflected in your Quick Parts and vice versa. I hope this tutorial will lead to a better experience for your users and to more complete and accurate metadata which will allow you to make SharePoint dance like your favourite D-list celebrity on Dancing with the Stars.